Everybody likes Istrian whites. In the summer a glass of cold Malvasia will refresh you with its acids and mouthwatering minerality. For aperitif try Muscat (croatian: Muškat), an aromatic, semi-sweet wine that will open your senses and prepare the stomach for the meal. They are both easy-to-drink wines that will give you a lot of pleasure even when drunk alone. Istrian reds do not have such immense popularity. The most important red wine is Teran, made from autochthonous grapes of the same name. Its main characteristics are dark ruby color that easily tints the glass in violet tones, of robust body, taste of cherry, and high-acidic component that often pierces your tongue without mercy. The last property is the reason why people that are not used to it often do not like it (I tried it for the first time at the age of seven!). But, they often forget that most of wines, especially the ones with a long tradition, are beverages meant to be consumed with food possibly in the region where they are produced. Try it with some local prosciutto, sausages, matured cheese or some game dishes, and I am sure you will love it. It is nice to know that Teran is also healthy since it contains a lot of of polyphenol antioxidants (anthocyanins, flavonoids) that are responsible for its impenetrable color. I tried a lot of good Teran on Vinistra and the conclusion is that winemakers want to make it more and more smooth and less spiky. I hope they will not exaggerate and turn the wild and unpredictable lyon into a cute and tender kittycat. For a young Teran that smells and tastes very traditionally go for the one from 2008 from Tercolo winery. For a bit more evolution and complexity, try the 2007 Teran from Rossi winery that is smoother but still follows the tradition (43 kn/6 eur). Rossi winery also produces an excellent Refošk, a fruity, mineral and well balanced wine. Refošk (italian: Refosco) is a cousin of Teran popular in neighbouring Italian region of Friuli and Littoral Slovenia. Even milder is 2007 Piquentum “Teranum” – Teran from Dimitri Brečević where the strong acidic backbone is well equilibrated (45 kn/6 eur). Roxanich winery has also 2007 Teran Re (over 180 kn/25 eur) that wants to be Californian Cab, which I find a bit exaggerated. On the other hand, 2005 Roxanich Merlot I can only praise. I was never fan of Merlot from Istria since it was always too young and too vegetable in aroma and taste. Roxanich’s Merlot proved it is possible to produce a red wine that approaches the complexity and balance of a great Merlot from Bordeaux. Maceration lasted 30 days in large oak barrels, and no foreign yeasts were introduced. Aroma is strong, of red fruits, mostly cherry and blue plums, with notes of dry grass, vanilla, graphite and cloves. In mouth, balance is slightly prevailing to the hard side, more due to strong tannins than to acids, but with food you will not notice it. Full bodied, minerality is excellent, which makes a long (you feel the flavor of cherry for ten seconds) and pleasant finish. 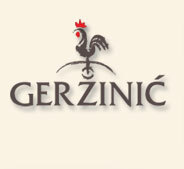 An excellent wine with only one drawback – its high price (over 180 kn/25 eur). Roxanich produces also an excellent 2007 Rosé, made from Borgonja grapes that is local name for french Gamay. Maceration lasted two hours, also in large oak barrels, and again fermentation proceeded only with indigineous yeasts. It is a dry and refreshing wine, well equlibrated, of floral aroma and nice minerality, a perfect summer wine. (100 kn/13.5 eur). I tried also 2008 Rosé from Veralda, made from Refošk grapes, but it did not impress me much. Aromas were too shy and it had too much residual sugar that was not well equilibrated with acids. Personally, I prefer dry Rosé that goes perfect for aperitif. Finally, I should not forget Syrahs that are slowly finding their habitat in Istria. First vines have been planted just few years ago by Marko Geržinić and Bruno Trapan and they say they are progressing very well. Probably beacause climate here is similar to the one in South Rhone Valley, Syrah’s homeland. But, even now Syrahs from Gržinić and Trapan wineries are excellent wines. The first is made more in the New World style, while the one from Trapan tends to follow the traditions of the old continent (here are my tasting notes). Syrah has great potential in Istria, and in the following years great results will follow. I am sure it will become very popular since it has pronounced fruitiness and, in contrast to Teran, acidity is barely perceptible.